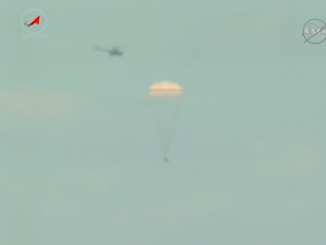 A Soyuz spacecraft carrying a three-man crew parachuted to the flat grasslands of Kazakhstan on Saturday, returning home from the International Space Station with cosmonaut Yuri Malenchenko, NASA astronaut Tim Kopra and British flight engineer Tim Peake. 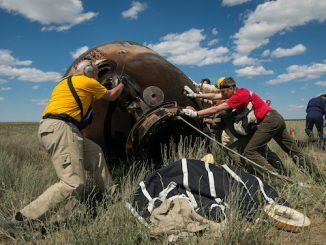 A Russian cosmonaut, a NASA astronaut and a British flier strapped into a Soyuz spacecraft, undocked from International Space Station and plunged back to Earth Saturday, safely landing on the steppe of Kazakhstan to close out a 186-day mission. 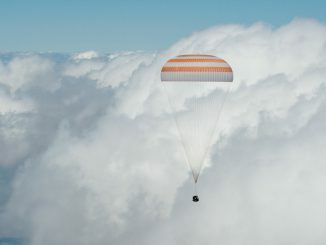 Veteran Soyuz commander Yuri Malenchenko, outgoing space station skipper Tim Kopra and British astronaut Tim Peake departed the International Space Station early Saturday aboard the Soyuz TMA-19M capsule and landed in Kazakhstan at 0915 GMT (5:15 a.m. EDT). Three space station crew members made final preparations Friday for undocking and landing in Kazakhstan early Saturday to close out a 186-day stay in orbit. Russian managers have delayed the launch of a Russian-U.S.-Japanese crew to the International Space Station two weeks until early July to allow time for additional software testing on an upgraded version of the Soyuz spacecraft. A Russian Soyuz spacecraft streaked into space and chased down the International Space Station Tuesday, but a problem with the ferry ship’s automated rendezvous system forced commander Yuri Malenchenko to take over manual control at the last minute. 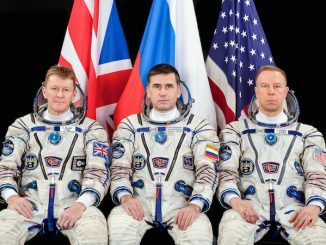 Three crewmen from Russia, the United States and Great Britain blasted off toward the International Space Station on Tuesday, rocketing into space from the Baikonur Cosmodrome in pursuit of the orbiting research lab. 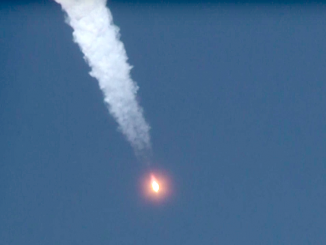 A three-man crew led by six-time space flier Yuri Malenchenko rode a Soyuz rocket into orbit Tuesday, speeding away from a Kazakh launch pad on a six-hour chase of the International Space Station. 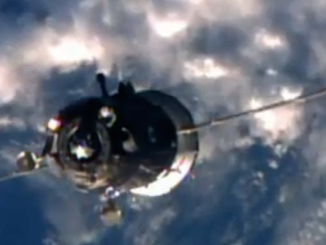 Docking occurred at 1733 GMT (12:33 p.m. EST). 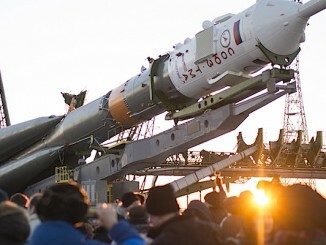 Tugged along a historic route leading to the launch pad where Yuri Gagarin took off 1961 to become the first person in space, a Soyuz rocket rolled out of its assembly hangar in Kazakhstan and stood up on its launch mount Sunday.